One of my favorite NBA players is Thunder’s Kevin Durant. I love his playing ability, but love his humble attitude even more. If you have been keeping up with sports you know that the NBA just got done being in a pretty long lockout. 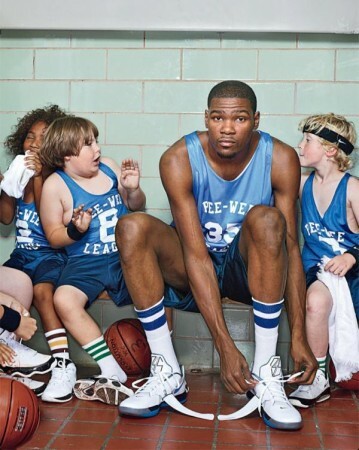 Durant didn’t let the lockout keep him from doing what he loves, playing basketball. Early in the lockout he joined a nationwide street ball tour, then starting doing exhibition games with other NBA players, and even showed up to play flag football on OSU campus! After watching Durant’s attitude and activity during the lockout, I believe youth ministry can learn a few things from him. First, we must leave the church and go where students are. I’m not saying we should cancel youth group and small groups to go out on the streets, but what I am saying is that we must make an effort to reach out to students who will never come to our youth meetings or small group meetings. For a long time youth ministry has been operating in the “come and see” model where we build awesome youth buildings, have a rocking band, and wrap it up with a relevant talk. I’m not saying this model is wrong, but it’s not enough! For youth ministry to be effective we must also operate in the “go and reach” model where we don’t just expect students to come to our youth meetings, but we go where they already are and reach them with the Gospel. For example, this past fall I worked with a ministry called The Hangout. The Hangout is a ministry that reaches out to Jr. High and Sr. High students in the Medina, OH area. Buckeye Middle and High school had to cancel busing so over the past few years students starting hanging out across the street at the library. Because of the amount of student hanging out the library starting complaining. Doug Bryant, youth pastor at LifeSpring Community Church, and Billie Conrad, member of Weymouth Community Church, decided to provide a room in the library every Friday where the students can come, eat food, and hangout. The students come and go, but the adults that help out have the opportunity to hangout with the students and build relationships with them. Working with this ministry showed me that there are students who will never step foot inside your church and if we don’t go out where they already are and reach them, no one will. Secondly, we must love ministry enough that if the position was taken away we would still do it. Let me explain. Currently I am looking for my first full-time youth ministry position. The search and wait is long, hard, and exhausting. The other day it hit me, would I still “do youth ministry” if God didn’t supply me a youth pastor position. So often myself, and others, think that to do ministry we need the position, but doing ministry should be our life! Kevin Durant didn’t stop playing basketball when the NBA season was gone, he kept playing. I hope and pray that we will continue to do youth ministry even when the “position” is taken away from us for some reason or the other. Maybe it’s the church letting you go or your only hired as a part-time youth pastor. Your ministry is not defined by your position! God saved us so we could do ministry as a lifestyle. I love youth ministry and encouraged by the direction it is currently going. But I hope and pray that we will not settle and always look for ways to make it better. God has called us to reach students and teach them His Word. As culture changes, we must change our methods as well. The message will always stay the same, but let’s be flexible with our methods so we continue to reach students with the Gospel.